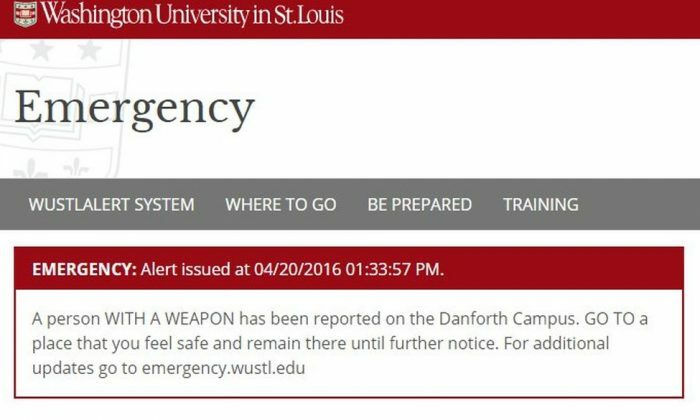 A gunman was reported on Washington University in St. Louis in St. Louis, Missouri. One person was reportedly shot at the Danforth Campus at Forsyth near Mallinckrodt Ctr., the school said. “GO TO a place that you feel safe and remain there until further notice,” the university added. “ALERT: A person was injured in a shooting on the Danforth Campus at Forsyth near Mallinckrodt Ctr. Continue to shelter in place,” the school wrote on Twitter. ALERT: A person was injured in a shooting on the Danforth Campus at Forsyth near Mallinckrodt Ctr. Continue to shelter in place. Check https://t.co/6nEsAjlRH3 for updates. We will share information as we have it. The school posted an alert on its website: “A person was injured in a shooting on the Danforth Campus at Forsyth near the Mallinckrodt Center. Continue to shelter in place. Check emergency.wustl.edu for updates. We will share information as we have it.” The message was posted at 2:07 p.m. local time.